That's what I think, anyway. Sunday starts Banned Books Week, also known as the annual celebration of the freedom to read. 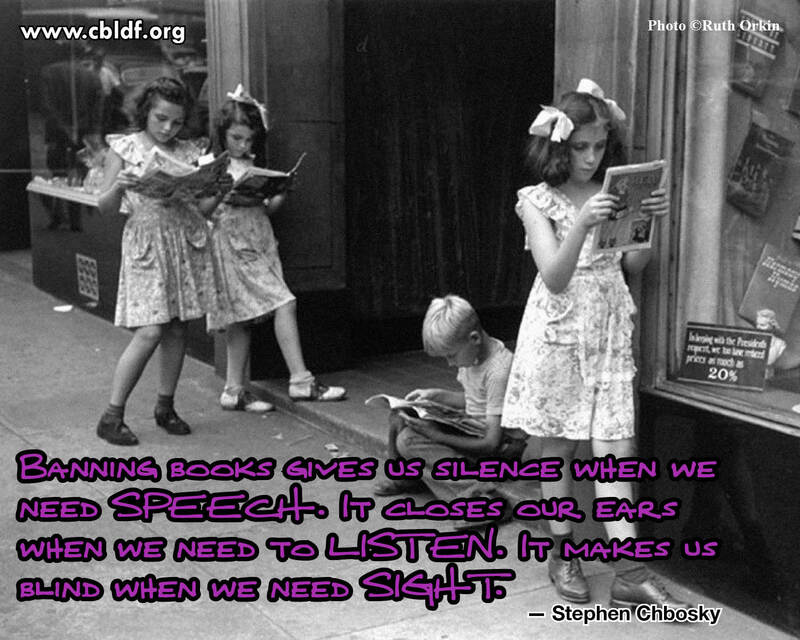 According to bannedbooksweek.org: Banned Books Week was started in 1982 in response to a sudden surge in the number of challenges to books in schools, bookstores, and libraries. According to the American Library Association, more than 11,300 books have been challenged since 1982. A challenge is an attempt to remove or restrict materials based upon the objections of a person or group. Not just them expressing their opinion, but actively trying to remove material from curriculum and libraries, restricting the access of others and threatening freedom of speech and choice. A banning is the removal of those materials. Like many of you, I cannot imagine a world in which I would possibly stoop to tell others what they should not read for moral purposes. However, there are many fearful assholes in the world, and those people would and do want to tell others what they can and can't read. Thanks to organizations like Freedom to Read, we are fortunate enough to be able to lay hands on the majority of these banned books. I donate to them yearly, this year in memory of Gamma as she was one of the readers who shaped my life. The First Amendment guarantees all Americans the right to express our ideas without governmental interference, and to read and listen to the ideas of others. 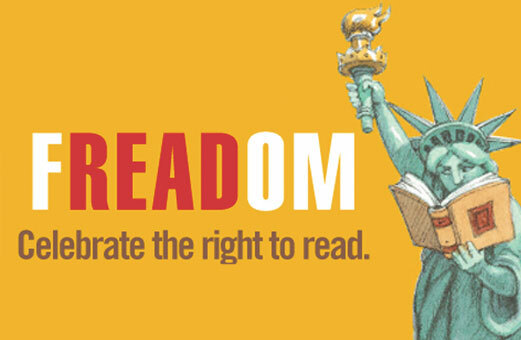 The Freedom to Read Foundation supports the right of libraries to include in their collections and make available any work which they may legally acquire. 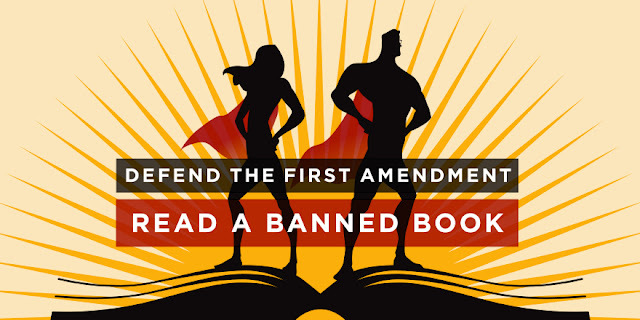 The American Library Association is all up in Banned Books Week, of course. As they should be. Librarians are typically badass warriors for the right to read. Next week, from September 25 to October 1, the ALA will be running pieces by authors on its Intellectual Freedom Blog. Be sure to check those out. As the ALA states, it's not only the librarians, though: it's the entire book community - librarians, booksellers, publishers, journalists, teachers, and readers - who support the freedom to seek and express ideas, even those some consider unorthodox or unpopular. Personally, I like to read a banned piece every year during Banned Books Week, and next week it'll be Leaves of Grass by Walt Whitman. I bet a book you loved has been banned or challenged - check out this list of classics, or the top 10 most challenged books of 2015 here. First, just be aware that there are maniacs who think they should be able to tell you what to read. Go ahead and give them the finger. Second, consider celebrating next week by reading some banned titles...because you can, thanks to advocates for freedom to read and those like us who insist on that freedom. Yayyyyer! I could have been satisfied just reading the title for this post. Amen! Thank you for the notice. I like to read a banned book each year during this week too. 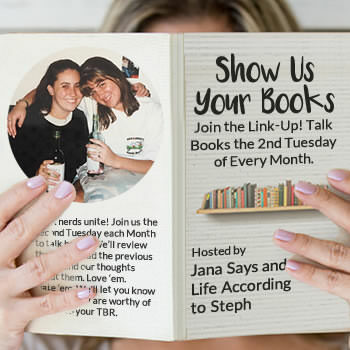 I had "read a banned book" as a category for one of my previous book challenges that I hosted. I think I need to re-use that category for future challenges too. I 💖💖💖💖💖💖💖 the Judy Blume quote! It's international day of Peace today which should be every day! Peace to all. 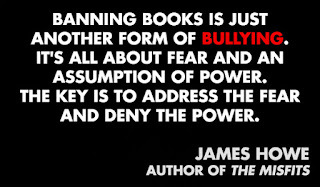 I'm pretty sure you could rationalize banning almost any book. Yep, the Hunger Games and HP are my faves. Where's Waldo? Really?! If a book is banned, I want and feel compelled to read it more. I feel like if they ban a book, it would make more people interested in reading it to see why it was banned. No one should be told that they can or cannot read something. I have read so many books in that image up there!!! LOL @ the 2015 banned books.. the bible? i mean, i'm not religious, but i do not care who reads the bible as long they don't try and make me read it. i've read a couple of books on that list though and i can't imagine living in a world where i wasn't allowed to read books like that. i know i have read a bunch of books that have been challenged or banned, but i will definitely try and find another for this week. 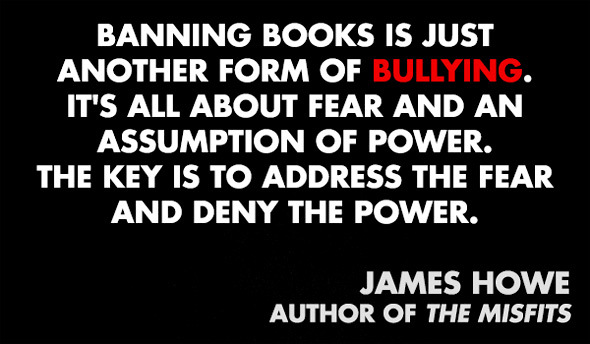 It's insane to think that there are still people who believe banning books is acceptable or justified. Actually I was reading a while back about Hitler's book, Mein Kampf, being the highest-sold book in Germany after it was finally un-banned, so there is definitely some truth that by making things forbidden, you also make them more interesting. And it's ridiculous to assume that just because they want to read something like they're, they're all secret Hitler-supporters. If anything, it'd be fascinating to see how all those horrors came about and how he justified it to himself. 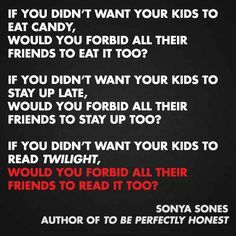 It blows my mind that in the land of the free - we have books banned over the DUMBEST reasons. But let's give kids access to the internet where EVERYTHING inappropriate is at. Or even in the palm of their hands. Ridiculous. I gotta go check out that list... so I can get angrier. "... there are many fearful assholes in the world, and those people would and do want to tell others what they can and can't read." Preach! Thanks for the reminder and I am most definitely going to enjoy a banned book next week. Thanks for the reminder! The concept of banned/banning books has made my skin hurt since I first heard it was "a thing," which I'm pretty sure occurred when I read about it in a Babysitters Club book as a kid. Hah! How's that for full circle? I agree whole-heartedly with you here. My very favorite books have all been challenged or banned. I didn't know about some of these banned books. 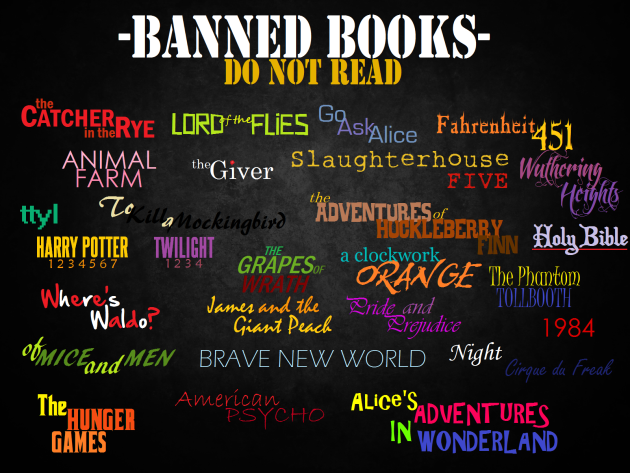 It seem like a such an oxymoron to hear banned books. Dumb. I've had some Harry Potter haters in my life, and I just couldn't understand it. Eh... to each their own... I guess. 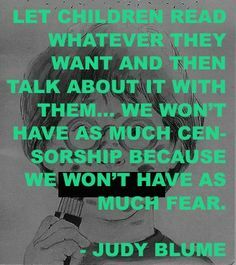 Mia (Pragmatic Mom) has a great KidLit blog, she has a similar philosophy (or at least I believe it was her) as Judy Blume. If your kid is reading that's good, you shouldn't be upset that they're reading something you deem is too beneath them, you should be happy their reading. Read on! Reading that books are still being challenged boggles me. I grew up in a really religious area, so I felt a lot of that about Harry Potter etc when I was a kid. I want to make sure my kid knows that they can read what they want, unless there is a legitimate reason like it's just not age appropriate yet. the interesting thing to me is a majority of the books on this list were ones i read in high school. they are firmly, FIRMLY woven into the tapestry that is the literary canon. I really liked the Judy Blume quote you posted because it perfectly describes the mindset I have when it comes to raising children. Obviously I don't have kids now, but if I end up having a kid one day, I'm definitely going to encourage reading and discussion. My mom allowed me to read any book I wanted to read while I was growing up, and I'd want to do the same. Some of my favorite quotes come from Catcher in the Rye... and I can't imagine not encouraging imagination through Harry Potter. People need to stay in their lane. If you don't like it, don't read it!